People can hate on you! People can stand in your way! People can try to hold you back! People can lie on you! People can go completely out of their way to stop you from getting what you (or they) believe that you should have. 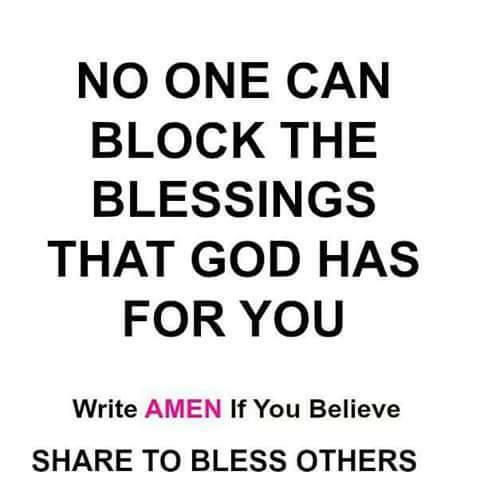 NO ONE HAS THE POWER TO BLOCK YOUR BLESSINGS BUT YOU! We are our own worst enemy at times and can’t seem to understand that our enemies exist because we allow them to exist! It is negativity that causes us to say or do negative things that we sometimes regret, and we will only receive negativity when that is all that we have on our mind. How can we receive our blessings, when we say that we can’t receive our blessings? How will we receive our blessings, when we say that we won’t receive our blessings? How do we appreciate our blessings, when we don’t believe that we have any blessings coming to us? It is this negative thinking that has us expecting the worst and usually getting the worst because this is all we ever look forward to. We have to look forward to blessings that we really want, live like we already have these blessings and work towards getting these blessings. We should always be our own biggest fan since no one will ever believe in us if we don’t or won’t believe in us! It is doubt that programs us to fail and we miss so many blessings in life because we don’t believe that we will receive these blessings. We will never know until we try and we might just receive the blessing that we have been looking for when we try to get that blessing that we were looking for. Confidence is not a bad thing when it comes to believing that we are capable, that we will rise if we fall, that we will learn from our mistakes and that we will not fail all the time. Even the best of the best become the worst of the worst at times, but they have so much confidence that they get their blessings by trying and trying and trying and trying!!! We sometimes miss our blessings because we overlook our blessings and then wonder why we are still looking for the same blessings over and over again. People have an arrogance inside of them that makes them feel like they are too good to accept blessings that are not up to their standards, but they complain about living below their standards. We all have to start somewhere! We can’t drive a Mercedes Benz before we start walking and definitely will not drive a Mercedes Benz without earning it in some kind of way. We might have to start at the bottom at times to make it to the top, but humbling ourselves enough to climb will get us blessings that we never knew existed on our way to the top where the blessings that we really want are sitting. We might not even get the things that feel are blessings, we might realize that the things that we place on a pedestal are not blessings, and we might come to the conclusion that the pictures that we paint for ourselves are not as valuable as we once thought. We can not allow pride to come between us and our blessings or we will miss our blessings and receive a dream. What might be worse than feeling like a blessing is beneath us is feeling like we should have someone else’s blessing, that someone else doesn’t deserve their blessing, or that we could do better with someone else’s blessing than they could. How could we actually notice our blessings when we are looking at someone else? How could we appreciate the value of our blessings when we place so much value on the value of some else’s blessings? How could we truly be happy with the blessings that we have when our focus on the blessings that make someone else happy? Sometimes it is best for us to get us some business, to mind our own business and focus on our business. Everyone is blessed in different ways and we must understand that everything that looks good might not be good for us. We have to start appreciating the things that we are blessed with and keep our focus off of the things that others are blessed with. We will not be blessed unless we get up and get our blessings. The blessing that is meant for today might not be available tomorrow and today was tomorrow on yesterday. We can not procrastinate and expect life to wait on us, we have to live – not just exist. Don’t allow negativity, doubt, pride, jealousy, or procrastination to block a blessing!! !